The Eleaf iJust series has had an upgrade. 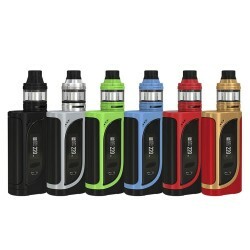 The ‘all in one’ Eleaf iJust NexGen e-cig has a 3000mAh i.. The Eleaf iStick MELO is simple yet powerful e-cig mod. With its integrated 4400mAh battery, various..
Intuitive, simple and stylish, the Joyetech eVic Primo Fit e-cig embodies everything vapers love abo..